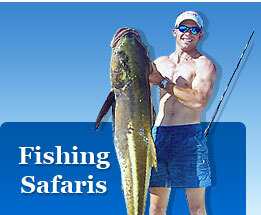 Welcome to ‘Dorado’ known for many years as one of the most successful big game fishing charter company in Phuket. With our new boats the tradition continues, whether it be a one day fishing trip or multi day charter to local islands. The new ‘Dorado’ is licensed to carry 21 passengers on day trips, and can sleep six on overnight and multi day safaris. Primarily a game fishing boat, ‘Dorado’ is also a very comfortable cruiser and if a non-fishing holiday is your preference, we are just as happy to ensure your choice of trip with us meets your expectations. Offering air conditioning, non-slip decks, dive tank holders, swim platform and plenty of upper and lower deck shaded seating and tabling for all, ‘Dorado’ is a lot of boat with very affordable charter rates. As a game fishing boat, we carry a large selection of quality tackle, rods and reels including Penn and Shimano. With an Australian fighting chair and a large non-slip fishing deck, it does not matter whether you are a complete novice or an experienced angler; you will be assisted by our skilled crew who always endeavour to meet your fishing expectations. Copyright The Big Blue Phuket Co Ltd. All right reserved.